Now that IS an impressive collection! That's a lot! Nice collection, sell them in ebay hehehe..
wow... what a collection. i am also a bag person but if i have grown used to it, i give the bag to another person. i have given several of them. 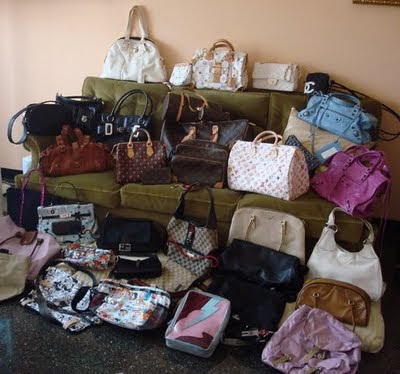 what a great collection of bags. I only have one purse ... come check it out. Holy cow! That a collection! I think I own three. Same as the number of my shoes. Great collection you've got here. You're giving my human bag envy. A girl after my own heart! Gotta love that collection! wow that is a huge collection!